Postwar is the creative company of writer/director S G Collins. Collins makes short movies to help people and organizations tell their stories. He's been in the business since 1981, creating marketing films, TV spots and other visual media for both small and globally active enterprises, including nonprofits and academic groups. His clients value Collins's ability to present a complex technology, or an arcane value proposition, in such a way that lay people swiftly grasp its significance. The goal is always to make a real difference in viewers' minds. Brief showreel of Collins' work (2:35 min). Collins's method is simple: focus on true meaning. Collins tries to break through the trap of corporate 'internal focus' and express the real significance of his clients' ideas in plain language. Clarity and concision are his most sought-after virtues. But it's not enough for the message to be accessible: it also has to be true. Each project obliges the filmmaker to learn and understand the client's ideas thoroughly enough, that he can then plot the shortest path to the viewer's mind. Over the years Collins's clients have included Sony, Alcatel-Lucent, Reebok, Hologic, IBM Software, L'instrumentarium Paris, Lensman, Euro-IX, Avid, NewTek, TraceLink, Dunlop, EeStairs, Raptim ... and Mr Tong's restaurant. 'Continuum' (01:32) Hologic. Corporate image film. 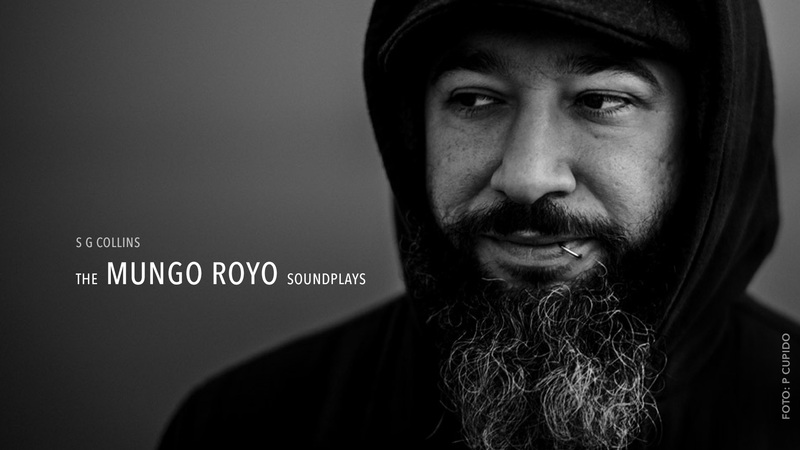 'Taboo Talks teaser' (02:00) Taboo Talks. Teaser / show open for a series of seminars on difficult subjects. 'The unexpected woman' (01:20) Hologic. Opener for women's leadership conference. 'EeCrew' (01:30) EeStairs. Film to recruit new craftspeople. 'Dream flight' (02:00) EeStairs. Product marketing film for Dutch stairway design company. 'Life Sciences Cloud' (04:40) TraceLink. Tech product marketing film, pharmaceutical sector. 'Musicians Without Borders' (02:53) Nonprofit funding appeal. Collins designs web spots for cafés and restaurants. 'Zest' (01:30) Zest, Amsterdam. Small business, restaurant web video. 'Mr Tong's' (00:30) Mr Tong's Asian Restaurant. Small business, restaurant ad. 'Sushi Me' (00:30) Spot for sushi delivery in Amsterdam. Small business, restaurant ad. 'Hungry?' (00:20) Spot for cake shop. Small business ad. Collins also creates purely imaginative works. Collins also has an active life as an independent artist, leaving a trail of short dramatic films, no-budget docus, underground music videos, sound plays, fiction, paintings and music. He is always working  either making up stories or telling true ones. 'Volk vs visgraat' (2018) (27:30) (English: People versus fishbone) A documentary about how radical changes in public transit policy are affecting the lives of eight Amsterdammers. In Dutch with English subtitles. 'Heidi Helressel's weirdest Tuesday' (2017) (30:00) A strange little Amsterdam story about 24 hours in the life of a young novelist. In English with Dutch subtitles. 'Burgerzaken' (2015) (14:30) Surreal love story about a guy drifting between dreams in contemporary Amsterdam. In Dutch, with English subtitles. 'Bang' (2016) (14:02) Two people who share the same fear meet by accident on New Year's Eve in Amsterdam. 'A different Texas' (2016) (09:40) A stranger sits next to her in the café, claiming to be sent from the future. Aleksandra Anisimowicz: 'Hier soir ' (2012) (03:18) Music video, made in Paris. From Poulenc's 'La Voix Humaine'. Niets zeggend' (2009) (17:40) Documentary about the lost choreographer, Micheline Dumonceau. Four audio dramas set in a dystopic future, featuring a philosophical ice cream man with mysterious powers. All the 'actors' are friends of Collins. Some of Collins's writings are available for purchase from Amazon. 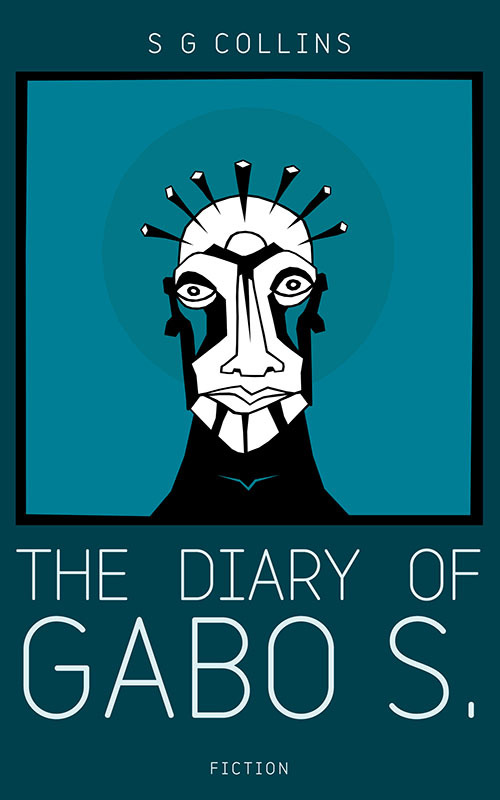 The diary of Gabo S.  (fiction)... The implants in his brain are meant to stabilize his behavior. Instead they unleash his latent clairvoyance, and kick him off on a globetrotting mission to save the world from the Devil. 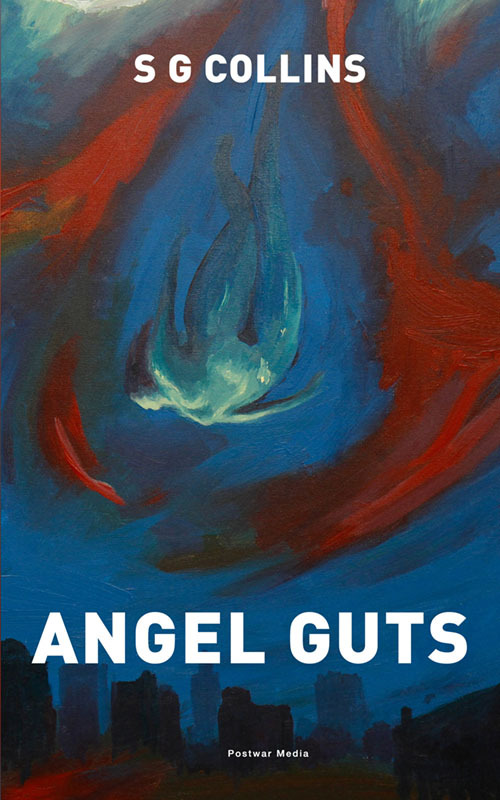 The seven troubled women he meets along the way will be his accidental guides. But his doctor, and a curious journalist, are both kinda worried about him. 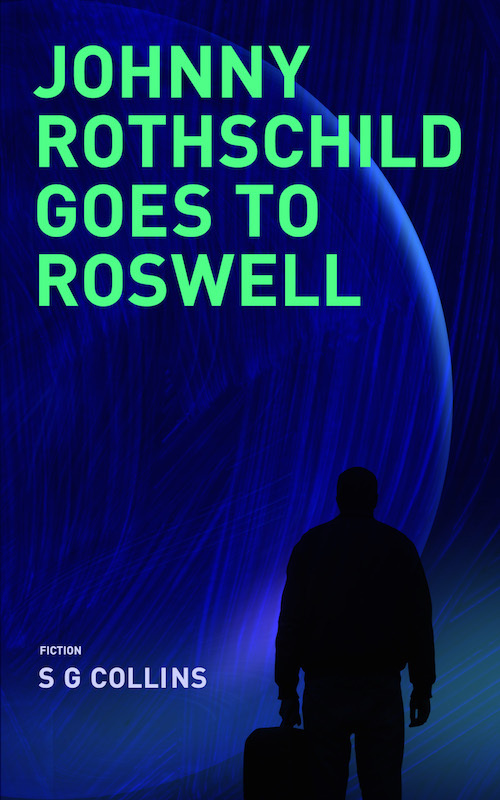 Johnny Rothschild goes to Roswell  (fiction)... Last night he was in Munich in 1978. Today he’s in Roswell NM, forty years later, with two kilos of cocaine and no idea how he got here. He gets mixed up with a cop, a brilliant donut girl, a shrink, a sculptor, two refugees and a pair of real nasty criminals. Without meaning to, he changes all their lives. But everyone and everything from his old life is lost. He can never go back, only forward. What, on Earth, is the universe trying to show him? 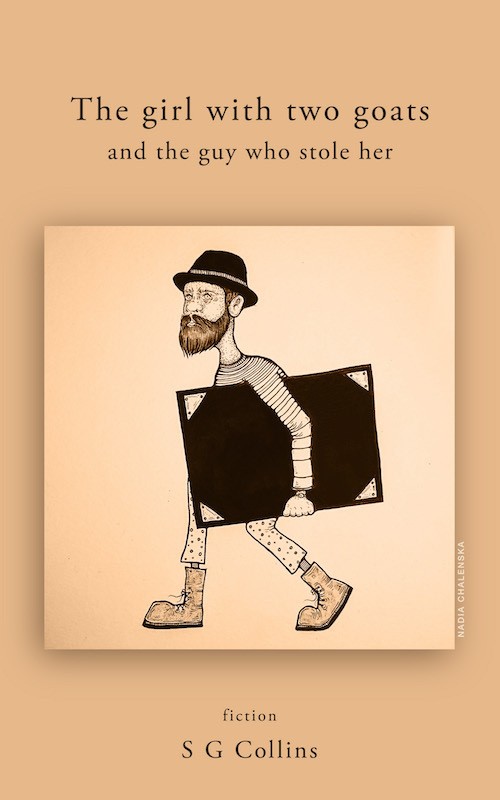 The girl with two goats and the guy who stole her  (fiction)... This old bus driver from Alkmaar has a secret. Almost thirty years ago Floriaan stole a great painting from a museum, and has been hiding it ever since. If he can keep it hidden just a bit longer, a loophole in the law just might make him its owner. Then he can be rich. But others are trying to find the masterpiece before that happens — including, just possibly, the woman he has fallen in love with. 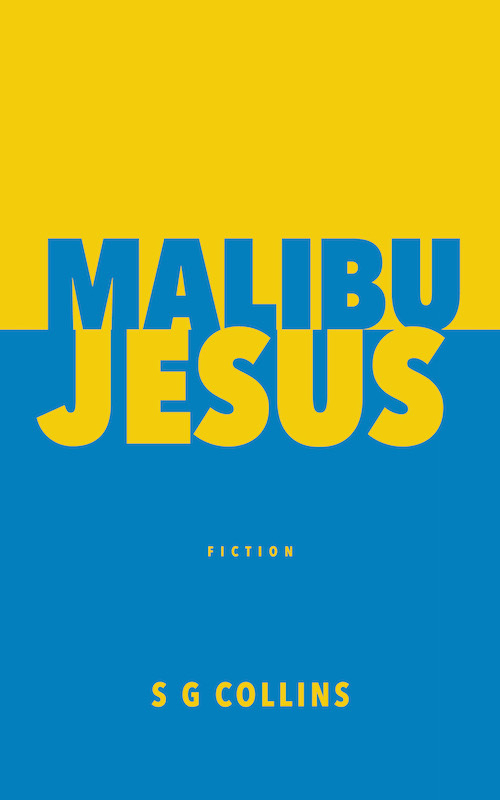 Malibu Jesus  (fiction)... He wakes up lucky, and has no idea why. And he seems to have sprouted a gift for helping people. 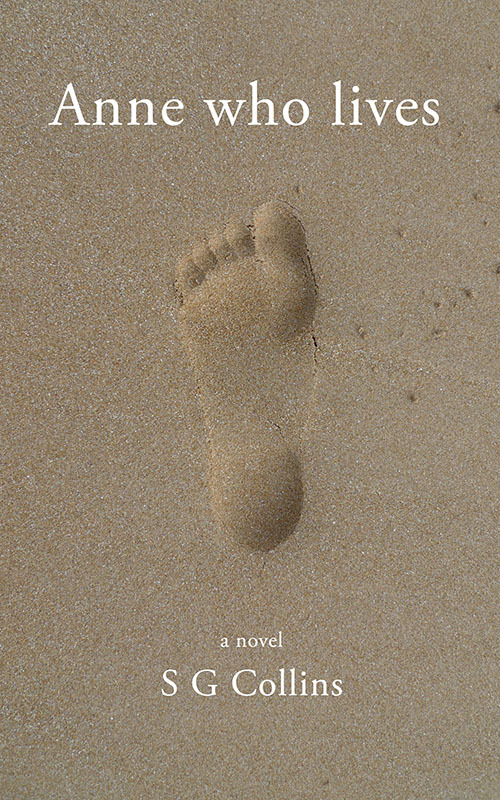 His newfound role as the reluctant ‘Awakener’ lands him in some extremely Malibu situations — always with one foot on each side of the fault line between rich and poor, reality and illusion, love and pain, comfort and disaster. Anne who lives  (fiction) As a young girl, she spent three years in hiding from the Nazis. As an old woman, she helps a young one escape from an abusive boyfriend, and must choose between safety and truth. In between, she leads a blazing, accidental, creative and controverisal life. A life that should have happened. This book features in the 'Heidi Helressel' film. Susan at the center of the universe  (fiction) Set in Amsterdam. 'Time and space begin ... in the palm of your hand.' A new age wanderer moves in with an astrophysicist. Science and spirituality collide. Sexual tension swirls. And they accidentally learn from each other. 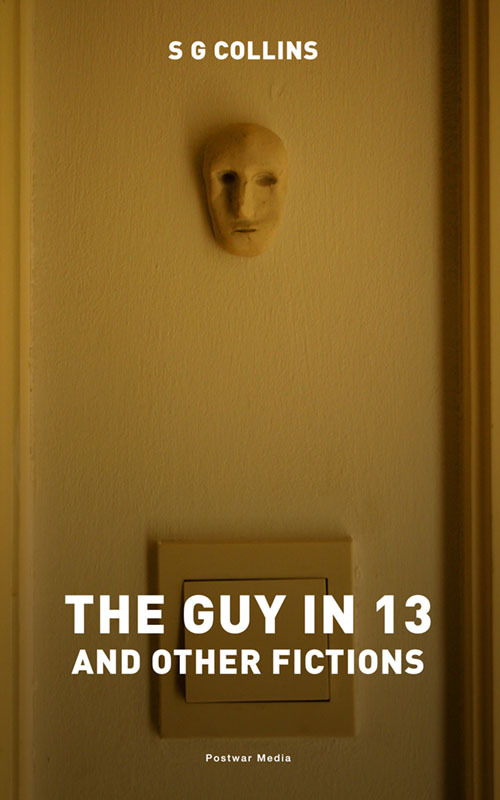 The guy in 13, and other fictions  A collection of short stories that take place in Amsterdam, Atlantic City, Boston, Buffalo, Los Angeles, Montreux, Niagara Falls, Paris, Peenemünde, Providence, Toscana, and various surburbias of the heart. 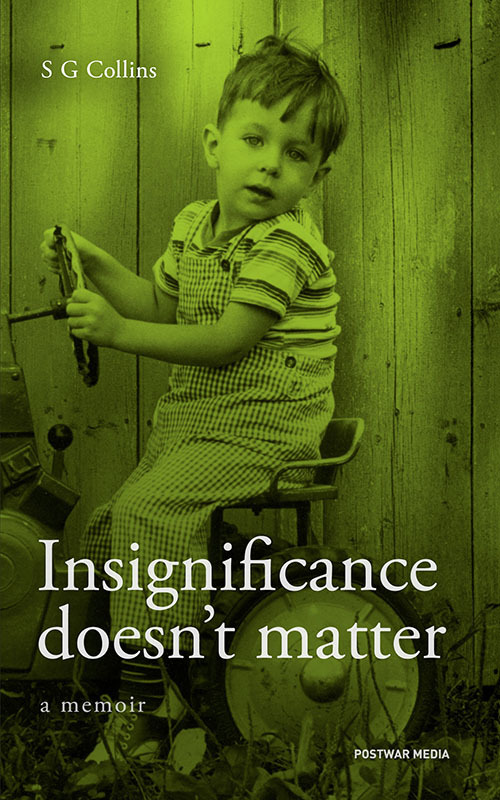 Insignificance doesn't matter  A memoir. All content on this site Copyright © 1982-2019 S G Collins / Postwar Media  except works-made-for-hire copyrighted by their respective owners.